Terra cotta clay pots undergo firing at around 2,000 degrees Fahrenheit, so they can handle just about anything you put them through -- except poor care. 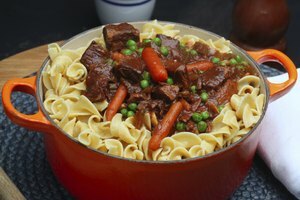 Anything you can do in a braising dish you can do in a terra cotta pot, along with a couple of other benefits. Terra cotta is alkaline, and raises the pH of foods during cooking, so tomatoes, for example, have a sweeter taste than when cooked in metal. It also creates a moister environment than metal, so foods cook in a more gentle manner. Seasoning separates terra cotta cookware from terra cotta planters and flower pots. Seasoning, or filling the terra cotta with water and heating it for a few hours creates adhesion between the clay molecules so they can withstand repeated heating. But before you season, you have to soak the terra cotta in a sink of water for 2 hours so the clay absorbs as much water as possible. You can season terra cotta on the stove or in the oven according to its size. Large terra cotta braziers and casseroles fit better in the oven, so that may be a better choice for them, but smaller pots can be done either or. To season in the oven, fill the pot about 3/4 full of water and bake it uncovered at 225 F for two hours. To season the pot on the stove, fill it 3/4 full with water and place it on top of a heat diffuser set over a stove burner. Set the stove to low and heat the pot for two hours. Let the pot cool to room temperature in the oven or on the stove before removing it. You have to take it easy with spices and seasoning when you make your first dish in a terra-cotta pot. Terra cotta still has room in its porous surface to take on the esters and volatile oils of pungent foods, such as garlic, hot peppers and shallots, right after seasoning, so make your first dish is a neutral one. One suggestion is to fill the pot half full of chopped carrots and celery coated with a little olive oil and roast them at 350 F until golden brown. You can also fill the pot with 1 to 2 inches of chopped celery and carrots and place a chicken breast on top and make it a meal. Terra cotta care is minimal, but integral to a long life. 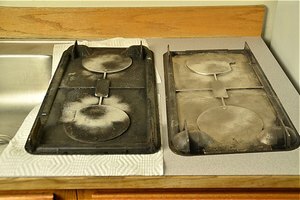 Use a heat diffuser when cooking with terra cotta on the stove, and don't go hotter than medium-low until you get used to cooking with terra cotta on the stove. After you get accustomed, you can go as high as medium. Always start cooking food in a room-temperature pot and in a 200-F oven. You can increase the oven temperature to the desired temperature over a 5-minute period. Clean terra cotta using mild dish detergent or in the dishwasher if it's labeled dishwasher safe. Soak the pot in water 15 minutes and wipe it dry before each use.